I am very happy to be able to participate in this fascinating roundtable on the inspiration behind research projects and to share my what I suspect are fairly common experiences among our readership. My dissertation, completed back in May, is now a manuscript entitled, Past and Prologue: The Politics of Memory in the American Revolution, that is under contract to Yale University Press. Past and Prologue explores the role of “history culture” and changing historical memories of the colonial and British pasts in the coming of the American Revolution and early efforts to forge a shared national identity in the revolutionary era. It traces that role in shaping the transition from British subject to American citizen through three developments: the deconstruction of colonists’ relationship to the British past before independence; the creation of a newly shared colonial past for the first time during the imperial crisis and the revision of that colonial past after the war; and, the cultural construction of a “deep national past” or American antiquity in the decades following the war. Rather than having “liberated Americans from the past,” I argue, the Revolution actually made the past matter more than ever before. My project’s origins can be traced back to an honors thesis I wrote as an undergraduate at City College that focused on the debate in 1750s New York City over the founding of King’s College. Put simply, the city’s powerful Anglican establishment wanted the new college to be an Anglican seminary that could counter the regional influence of Yale and the newly established College of New Jersey. Young Presbyterian dissenters, including William Livingston and William Smith, Jr., pushed back, wanting the new college to be open to students of all denominations. Though my primary focus was on the two sides’ competing understandings of “enlightenment,” in tracing this debate through newspapers, pamphlets, and correspondence, I was struck at one point by just how often both sides made references to the seventeenth-century British past, particularly in characterizing their opponents. The dissenters, according to the Anglicans, were “little Cromwells” and “Levellers,” while to the dissenters the Anglicans were sheep in Archbishop Laud’s clothing. I came to understand that both sides’ different understandings of the British past were shaping how they perceived the contemporary political conflicts in which they were engaged. I ended up addressing this very briefly in the final paper but the theme stuck with me. When I got to graduate school and was faced with choosing a dissertation topic, I returned to this theme. Hence, my dissertation was initially supposed to focus on the role of historical memory of the seventeenth-century British past in colonial political culture up until 1776. I was somewhat “scooped” to the broad topic by Eric Nelson’s deeply researched, thoughtful, and iconoclastic monograph, The Royalist Revolution, (and the WMQ article that preceded it). Nevertheless, we had very different scopes, methodologies, and interpretations, so I pushed on. However, in the fall of 2014, when doing research on fellowship at the New-York Historical Society, I found a document that changed the questions I was asking and ended up expanding the scope of my project far beyond what was initially intended. 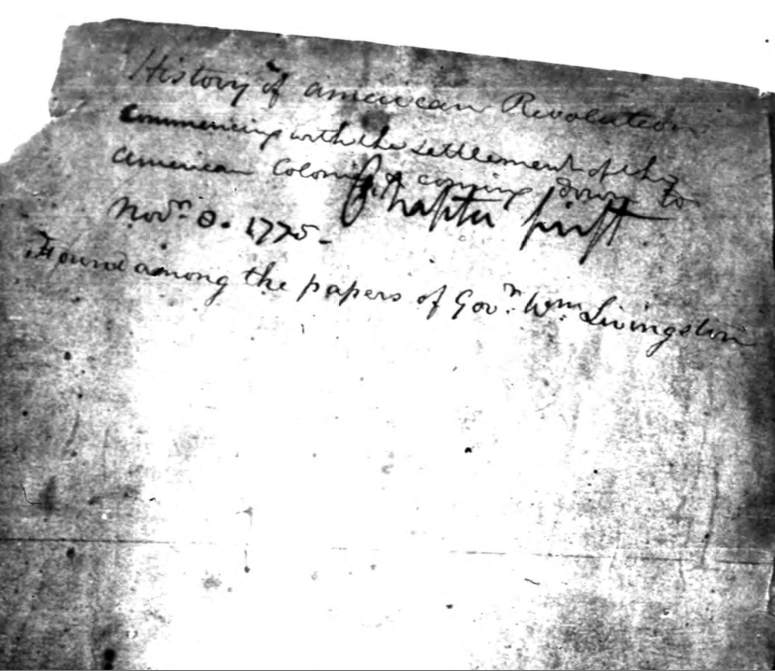 As I was going through the N-YHS catalog, I noticed in the John Jay Papers, the existence of a manuscript entitled, “History of American Revolution … found among the papers of Gov Wm Livingston.” I knew Livingston had not written a history of the Revolution, so I began transcribing this 500+ page manuscript. 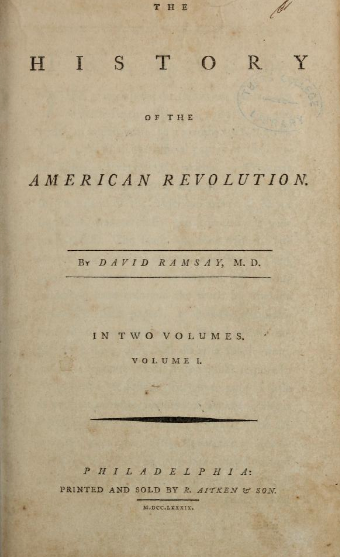 After a few initial searches of text snippets in Readex, Google Books and archive.org puzzlingly turned up nothing, more searches revealed that it was a partial draft of the first six chapters of David Ramsay’s History of the American Revolution (1789). After transcribing the first few chapters, I started comparing it to the published version. There were significant differences. The first chapter of the draft covered settlement and the history of Britain in the seventeenth century, but in the manuscript the narrative of British history was excised and replaced with more detailed accounts of the settlement and development of each individual colony. This textual replacing of the British past with the colonial past led me to start thinking about how that process played out in the culture and politics-at-large. In other words, how did Americans stop thinking of the British past as part of their own shared history and replace it with a new “American history” made up largely of the consolidated colonial histories of the new states (and the recent Revolution)? The question increasingly fascinated me. I knew from my previous research that almost all of the histories written before the Revolution focused on individual colonies. Only a few largely uncirculated works were published before the Revolution that sought to treat the history of all the colonies in British America together (and neither were written by an American colonist). That is, there was no broad conception of a shared “American history” between colonists from different colonies prior to the Revolution. But just how does a society or culture go about disowning a long-held, previously shared past and creating a new one largely from scratch? And how is that process complicated when it is occurring amidst the unprecedented upheaval of revolution? Those questions, and my interest in them, ultimately convinced me that—as originally conceived—my original project could only tell half of the story, at best. I had to follow through to see how the change I saw in the edits of Ramsay’s manuscript was reflected in the broader politics and culture of the early national period. As I began doing that and finding that the story did indeed continue on, the chronological scope of my dissertation expanded from covering just under 50 years to covering just under a century. Indeed, because of the rapid growth in the early republic of “new” forms of cultural production, the scope of my source base expanded greatly as well. This is how my project, like those I suspect many others reading this, came to be structured by questions that emerged from the sources (a process that Lindsay O’Neill discussed earlier in this roundtable) and how my project developed, changed, and, ultimately, expanded well beyond what was initially intended. All that said, having read Rachel Herrmann’s excellent contribution to the roundtable about “learn[ing] to respect historiography,” has led me to want to offer a cautionary tale based on my own experience of starting too far in the other direction. A few obsessive long-time readers of this blog may know that I have a longstanding obsession with historiography (especially that of the American Revolution). Since the first half of my dissertation/manuscript looked at the role of historical memories in the well-trod political literature of the 1760s and 1770s, I did what I have done since I wrote my first research project as an undergraduate: I framed my initial questions in primarily historiographical terms. Doing so, however, led me to the exact opposite issue experienced by Rachel. My problem was not about learning to reckon with historiography so much as learning how not to let my own conception of my project drown in historiography. When asked about my topic early on (especially the first half of the dissertation dealing with the coming of the Revolution), even in informal conversational settings, I found myself unable to articulate it without some kind of in-the-weeds historiographical introduction. And so, a major part of finishing the dissertation and now revising the manuscript for me has been escaping the trap of framing my project in primarily historiographical terms. The moral of this story, I guess, is twofold. First, your project will almost certainly change as your research continues and that is a good thing. You should be open to it. Though, you should of course guard against that change being primarily expanding your project, especially to the point of making it too unwieldy. The second moral is: “in all things, moderation.” You don’t want to be either grad student Rachel or grad student Michael, paying either too little or too much attention to historiography when framing your project. That said, striking the balance between historiography and research is the key to any successful manuscript and learning to strike that balance is a process that will likely, as for both Rachel and myself, continue beyond graduate school and into the process of creating a book out of your dissertation. Subsequent research in the Benjamin Rush Papers at the Library Company of Philadelphia revealed that Ramsay had sent a few copies to “Eastern Gentlemen” looking for feedback on the manuscript, both in terms of facts relating to their local areas but also advice regarding the writing. This ultimately formed the beginning of another line of inquiry important to my manuscript focused on the collaborative nature of historical cultural production in this period and the networks that supported it. As far as I can tell, it is the only known extant copy of one of these manuscripts, which has languished unidentified in the Jay Papers until now. Ramsay’s main modern biographer, Arthur Shaffer, had done research at the N-YHS but made no mention of it in his biography or many articles on Ramsay.